My family is one of special abilities. Papa: good at reading & eating. Maman: shopping fast & eating icecream super fast. 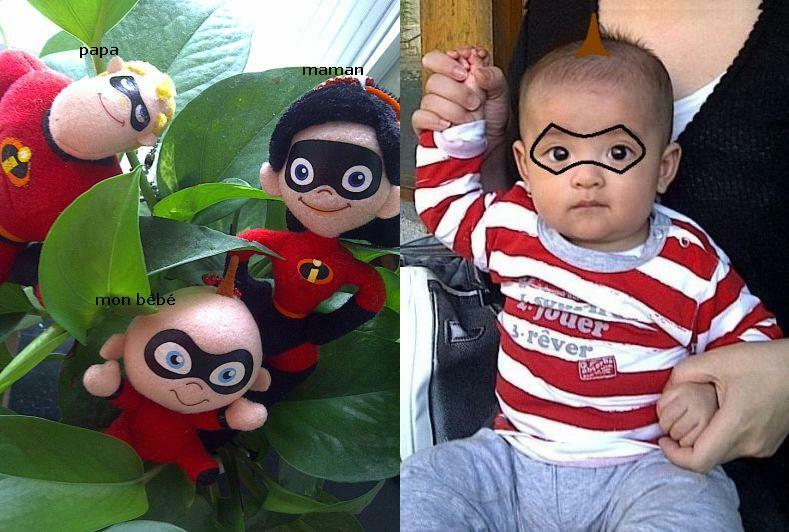 mon bébé: really really good at playing papa & maman. Fashion Tips: Absorba (www.absorba.fr) red striped top and grey pants. Nowadays mon bébé likes to roll and roll all over the living room. He often stops right under a table or a chair and stays there for quite a while. 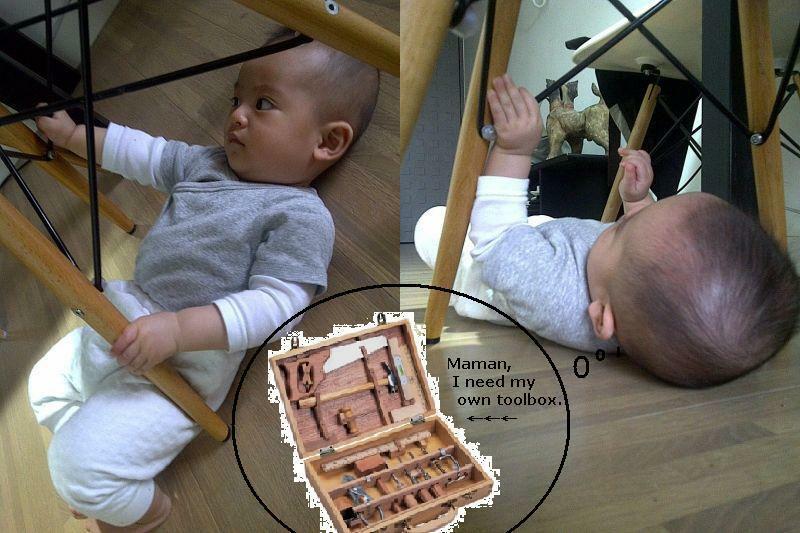 Mon bébé is just like a little carpenter, who takes his time studying the structure of a furniture. Fashion Tips: Old Navy bodysuit, Uniqlo grey kimono style bodysuit, and Combi pants. I always believe that a family is incomplete without A dog. Papa and I sometimes talk about bringing home a puppy to grow up along with mon bébé. We finally did that last week. We took mon bébé to a store, and let him choose between a Beagle (Snoopy type dog) and an English Bulldog (my FuFu’s english cousin). Mon bébé was very excited and smiled at both of them. Then mon bébé raised his small hands slowly and touched the bigger one. 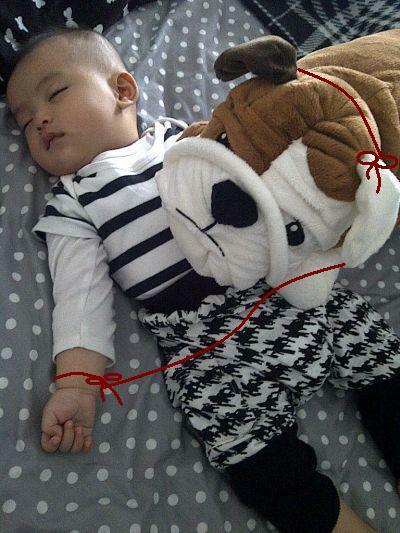 Just as Papa had wished, mon bébé chose the ugly but good-hearted English bulldog. Fashion Tips: Old Navy white bodysuit, Plenty Collection stripe bodysuit, and houndstooth pants. Mon bébé is full of surprises. 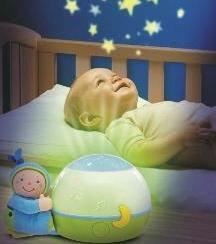 We found out the other day that he was playing with his goodnight stars projector (see picture ←) in a unique way. It appeared that mon bébé somehow turned on the projector and placed it between his 2 legs. 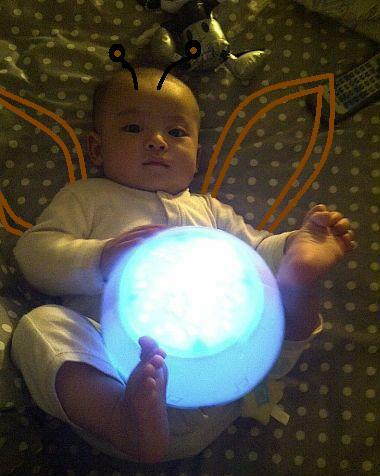 As a result, mon bébé was acting like a big firefly in our small bedroom. Fashion Tips: Baby Gap one-piece.